uring a stormy six-week crossing of the North Atlantic, the smallest of Frobisher's three ships sank and another turned back in fear. Only the flagship Gabriel, a tiny vessel with a crew of 18, continued westward. Eventually, on July 28 they sighted a barren rocky headland which Frobisher named "Queen Elizabeth's Foreland," in honour of his royal patron. This was Resolution Island, the most easterly outpost of Arctic Canada. 1569 world map by geographer Geraldus Mercator. 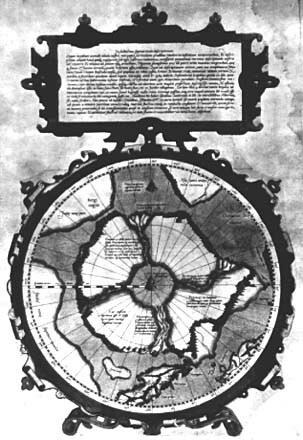 Frobisher had this map on his first voyage to the Arctic. To the west of Resolution Island lies a great bay reaching into the heart of Baffin Island. 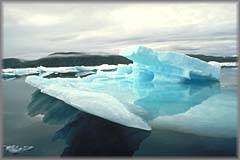 In contrary winds, and amidst dangerous ice floes pushed by some of the highest tides in the world, the Gabriel entered this bay and sailed westward. 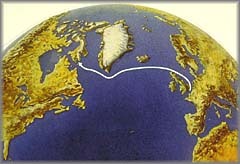 The crew members were convinced that they had found a passage to Asia. "And that land vppon hys right hande, as hee sayled Westward, he iudged to bee the continente of Asia, and there to bee deuided from the firme of America, which lyeth vppon the lefte hande oueragainst the same. This place he named after his name Frobishers Streytes, lyke as Magellanus at the Southweast end of the worlde, hauyng discouvered the passage to the South Sea (where America is deuided from the continente of that lande, whiche lyeth vnder the South Pole) and called the same sraites Magellanes sreightes." 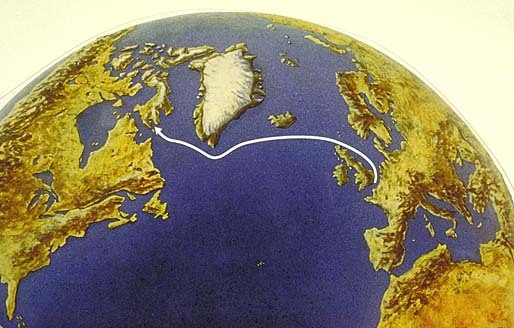 About 250 kilometres to the west of Frobisher's first landfall, "Frobishers Streytes" narrowed into a maze of islands, separated by narrow channels swirling with tidal currents. Frobisher must have begun to fear that his passage was a dead-end bay. 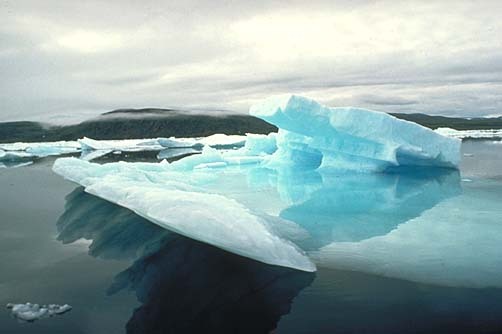 Today it is named "Frobisher Bay", at the head of which is situated the town of Iqaluit, the capital of Nunavut.